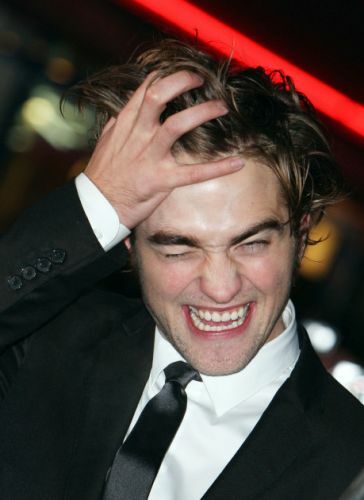 My grandmother wrote on my Facebook wall (yes, I said that) and said, “Hi UC, I read where “hunk” Robert Pattinson doesn’t shower and is stinking up the set.- thought you’d like to hear that.” Yes. She said that. I go by a fake name on LTR & LTT and that isn’t because I am afraid to tell our readers my real name, but I’m afraid that people like my grandmother, my dad and my great aunt Ruth will visit this site and send me letters about how they’re “disappointed in me.” I keep my mouth shut when people say inaccurate things about Twilight or judge it unfairly in public (it kills me), and I never EVER talk about you, Robert Pattinson, in public in any way other than to say “That actor Rob-something who is a vampire in some movie and a wizard in another.” I do this because I know that my knowledge about you and Twilight makes me look crazy. So I stay quiet. HOW DID MY GRANDMOTHER KNOW ENOUGH TO SEND ME THAT FACEBOOK MESSAGE (and who is teaching the old people how to use facebook!? STOP!)? I went on that rant because the video I am about to share made me feel extremely, extremely dirty. Yet that has not stopped me from watching it 3 times in a row or posting it online, despite the fear that my grandmother may or may not know about this site. Some might call me crazy, I just call me awesome.